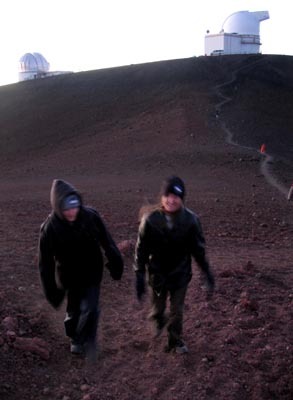 Today was Adventure Tuesday with Carly and Renata and the objective was Mauna Kea summit. 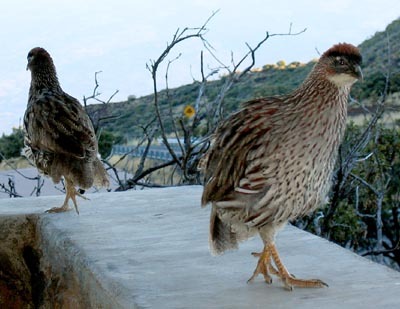 Here some birds hang-out at the Ellison Onizuka Visitor’s Center at about 9,800′ elevation. You’re supposed to stop to acclimate here at least 30 minutes before heading to the top. We were running late so we stayed about 15 minutes and headed up to get there before sunset. One hint, go early enough so you’re not driving with the sun low in the sky, it’s blinding when driving up the summit road. Renata and Carly head up the summit trail. Like a fool I ran up the trail so I could get ahead to take their photo coming up the trail, this knocked the wind out of me. 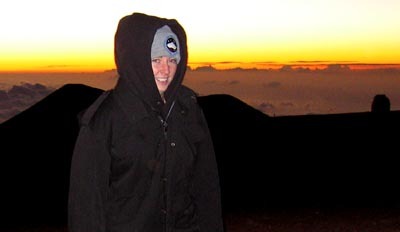 We didn’t make it up to the summit before the actual sunset, we did see it set beneath the clouds on the way up. But the afterglow was nice. Here’s Renata in the afterglow of sunset. Carly and Renata on the summit in front of the lele (altar). Hey, who’s taller? The little pole on the right side has the USGS benchmark for the summit. Beautiful on the summit. Clear skies, a brisk cold breeze (musta been freezing with the wind chill). Doesn’t seem like the Hawaii of palm trees and warm sand. After the summit trek we headed back down to the visitor’s center for some star-gazing via the various telescopes they have set-up there. An interpretive guide Eric pointed out planets, galaxies, stars and gave us a lesson in Hawaiian star names. 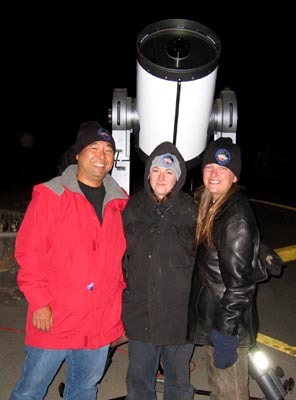 He also took this snap of us in front of one of their telescopes. The visitor’s center is open 365 days a year and it’s free to visit and look through telescopes, they also have a video about Mauna Kea and astronomy in the center. Eric said during the summer months they may have 200 visitors crammed there at night. You don’t need a 4×4 to get here, an ordinary car will make it to the visitor’s center, I’ve even gotten here with my Geo Metro XFi that had a 3 cylinder engine without problems.